Day 1: Atlanta, GA to Marion, IL. August in Georgia is hot—brutally, miserably hot—and this summer has seemed more broiling than usual. But we’re not complaining. The weather gave us just the nudge we needed to finally embark on a trip that has been on our “To Do” list for quite a long time—driving across western Canada. This excursion has found a tentative spot on our calendar for each of the last several years, but circumstances have conspired to push it to the back burner over and over again. This time, there’s no stopping us (we hope). We have four and a half weeks (before a commitment draws us back home) and plan to explore Canada’s Prairie Provinces—Manitoba, Saskatchewan (but will we learn to spell it? ), and Alberta. With our garage torrid enough to roast a Thanksgiving turkey, we trashed our plan to pack the car last night, so it was almost 8 a.m. by the time we pulled away from home this morning. An hour and a half of driving through Georgia on I-75 took us to Chattanooga, just inside the Tennessee border, where we veered west on I-24 toward Nashville. The scenery had become more interesting as we approached Tennessee and got only better as we drove through the state’s famed green hills. In Jasper, we tanked up at Love’s and drove to the nearby Shellmound Recreation Area to search for a letterbox. 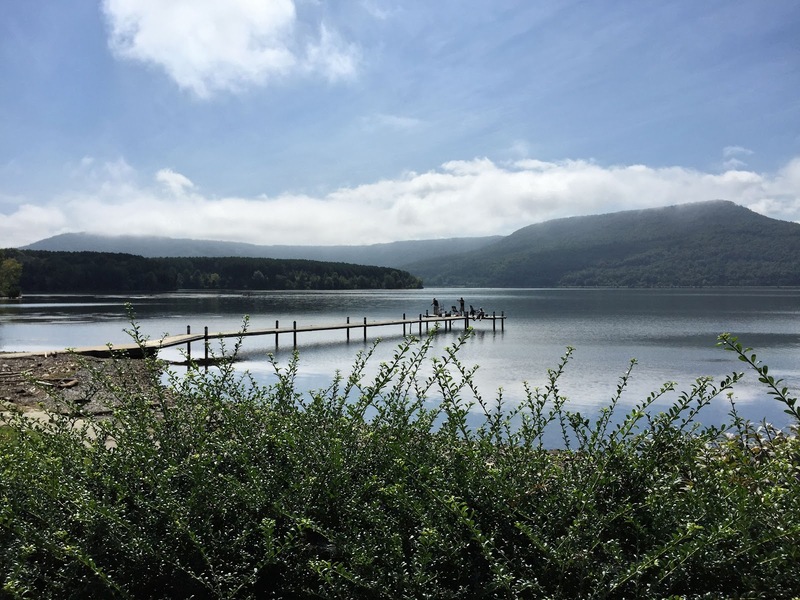 Home to Nickajack Dam, which separates Guntersville and Nickajack Lakes, the park was busy with locals enjoying water sports and fishing. 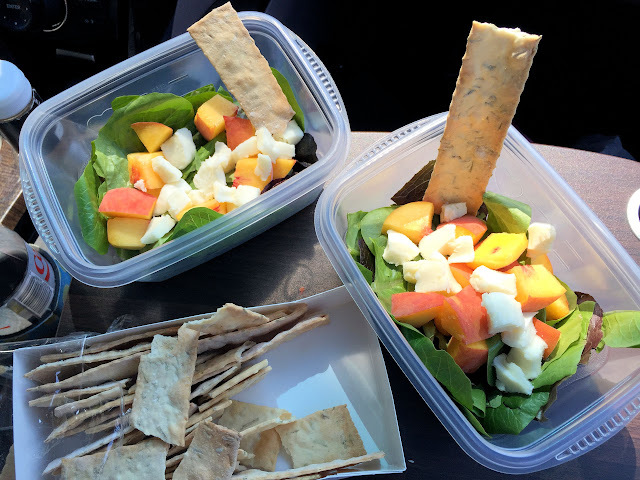 The letterbox was MIA, but the view of the pristine lake bordered by forest-covered hills was so appealing, we dug into our cooler and found enough ingredients to cobble a salad together for a picnic lunch. We had hoped to visit Kathy and Rachel and Steven in Franklin on our way through Tennessee, but today was Rachel’s move-in day as she prepares for her sophomore year at UT, so she and Kathy were off to Knoxville. Being the busy guy he always is, Steven had a jam-packed agenda for the day (and evening) closer to home. So we stayed on I-24 as it sliced diagonally across the state from southeast to northwest. When we reached Clarksville, near the Kentucky border, by 1 p.m. with only two hours remaining to our destination for the night, we decided to slow our pace a bit and do some letterboxing. The first box we searched for was in downtown Clarksville, near city hall and commemorated the nearby Roxy Theater. 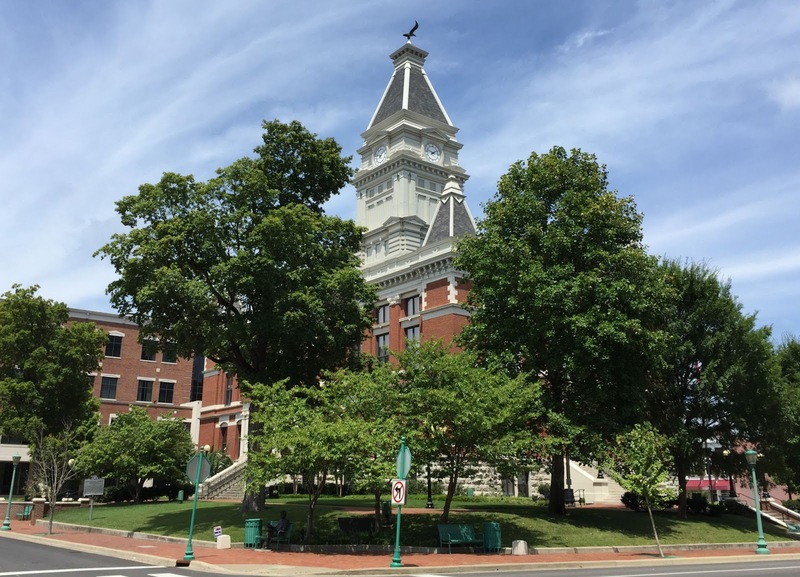 We were quite impressed with the very clean and active historic downtown area of Tennessee's fifth largest city (pop. 142,519). Hugging the Kentucky border, Clarksville was founded in 1785 by settlers led along Daniel Boone's Wilderness Road to this spot on the Cumberland River by a land speculator. A significant number of the town's early residents were soldiers mustered out of George Washington's disbanded Continental Army at the end of the American Revolution. 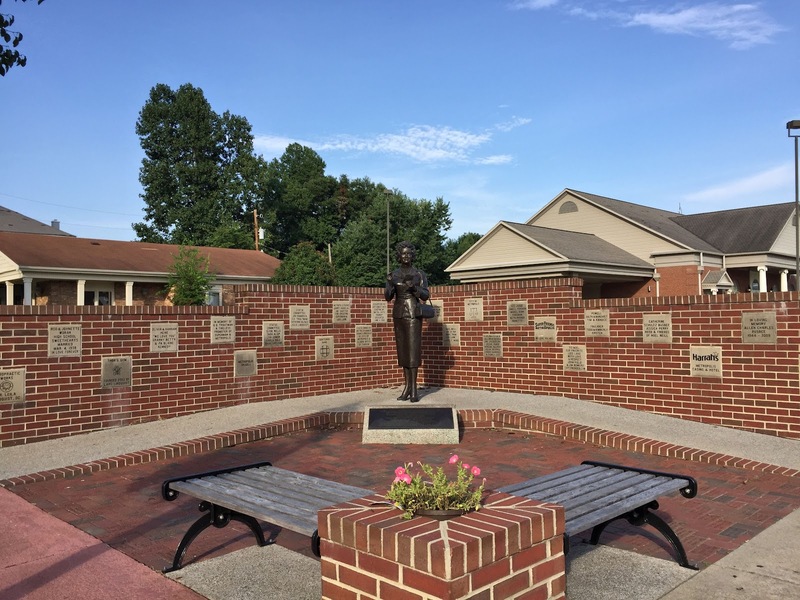 Lacking sufficient funds to pay the veterans, the fledgling government offered land grants instead as repayment for service to the new country, thus beginning this town's long history of military interdependence. 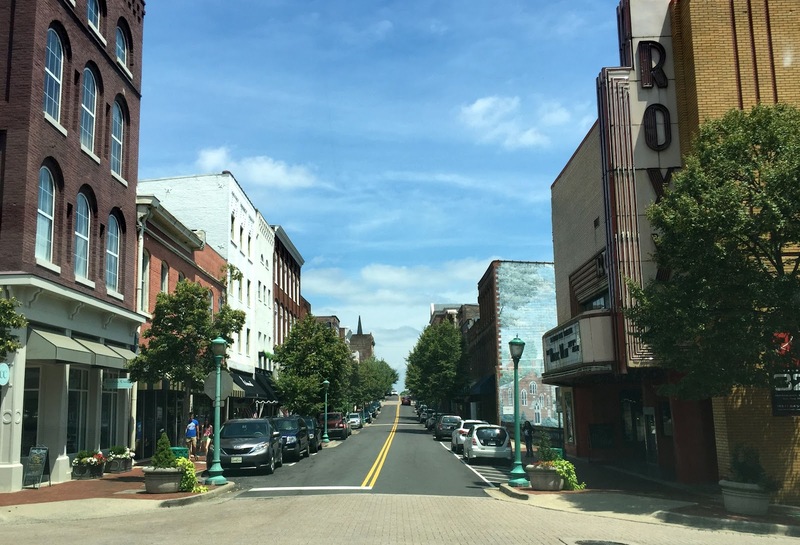 Had we not stumbled across a historic marker referencing the horrific event, we would not have guessed that in 1999, an F-3 tornado, with winds in excess of 200 mph, destroyed much of downtown Clarksville. Rebuilding efforts have restored or reconstructed most of the 500+ structures decimated by the storm. 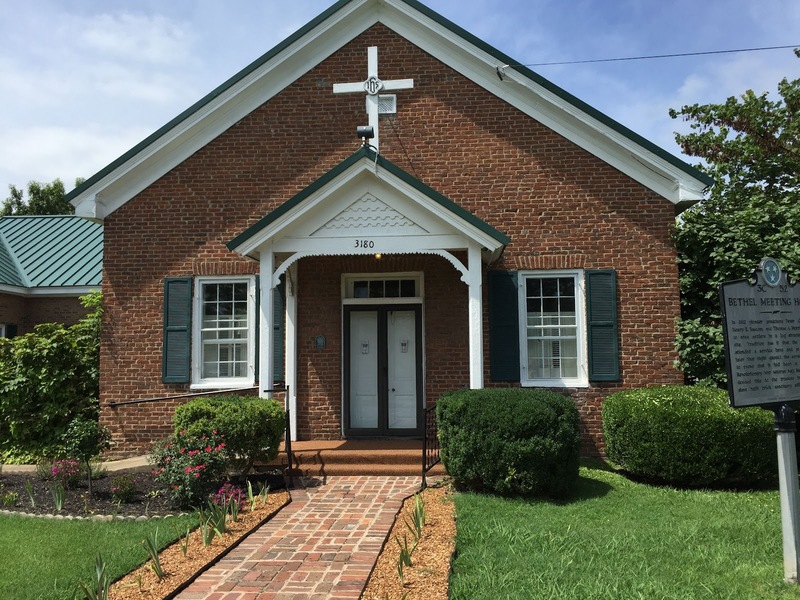 Our second letterbox in Clarksville was near Fort Campbell Army base at the tiny Bethel United Methodist Church. Established at this site in 1812, the modest church was saved from the chopping block by legislative intervention twice in the last century—in the early 1940s when the U.S. Army sought to commandeer the property for its newly established Camp Campbell, and again in 1956 when U.S. Highway 41 was widened into a divided highway, leaving the little church stranded on an island between the north- and south-bound lanes. After finding this second box, we entered Kentucky on US-41, shortly returning to I-24. As we try to move northward efficiently, we have returned to the world of interstate highways. 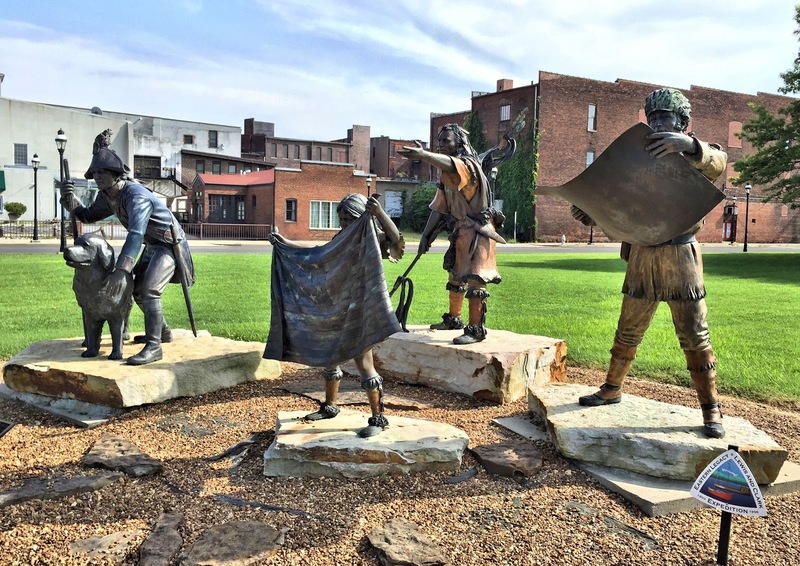 We pressed on through Kentucky, stopping at its northern border in the town of Paducah (pop. 25,018) around 4:30 pm. Though dedicated quilters would shudder to hear it, we stopped at the National Quilt Museum only to search for a letterbox nearby but did not enter this hallowed hall of patchwork art. We did pause long enough to check out a rather odd bronze memorial to the Lewis and Clark expedition on the museum grounds. Taking artistic license to a new extreme, George Lundeen, the sculptor, cast the young Native American girl with the face of a 20th century Caucasian child and added Sacagawea one dollar coins (since mercifully removed) to her ears as adornment. The generic Native American man has a replica of an Indian head nickel attached to his ear. 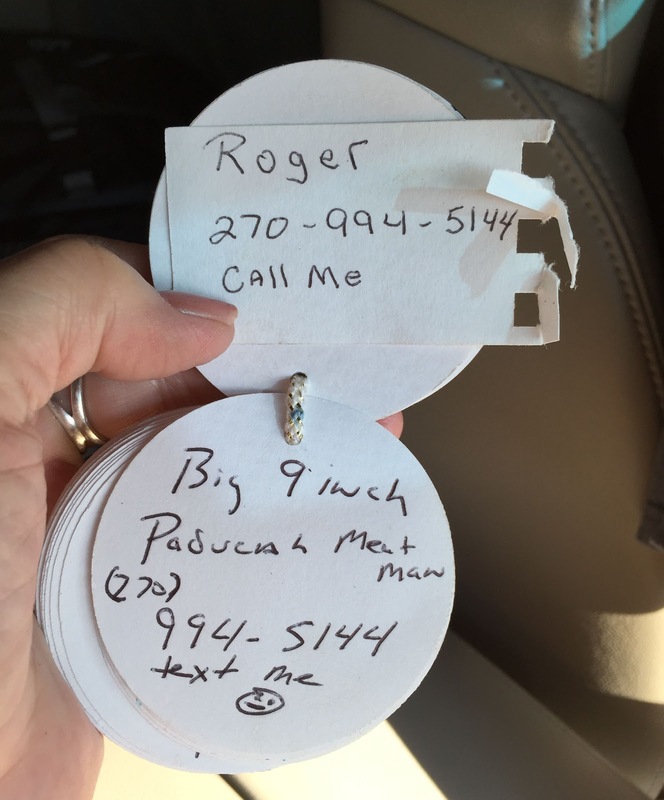 In our search for another letterbox at Paducah's Oak Grove Cemetery, we found a big surprise. When we reached into the center of a multi-trunk evergreen where a Colorado letterboxer had hidden her box, we pulled out a container that looked awfully familiar. It should have, since it was a box we had secreted in a similar cedar tree on the opposite side of the cemetery in 2012. Apparently, a novice finder from Texas had mixed up the boxes when she found both last February and switched their locations. On top of being in the wrong place, our box had also lost its stamp. It seems that some poor fellow, looking for love in all the wrong places (a cemetery?? ), had confiscated our stamp when he chanced upon the letterbox last August. We inferred this from the fact that a finder in July had commented upon the stamp, whereas a September finder reported the stamp missing. In the interim, some kind boxer had subsequently added a store-bought stamp (unrelated to the theme of the box, but who's counting). We were debating whether to retire the box when it made the decision for us. As we were returning it to the tree described in our clue, the box discovered a crevice in the trunk and took a dive into it, falling down into an irretrievable position. At that point, all we could think was R.I.P. 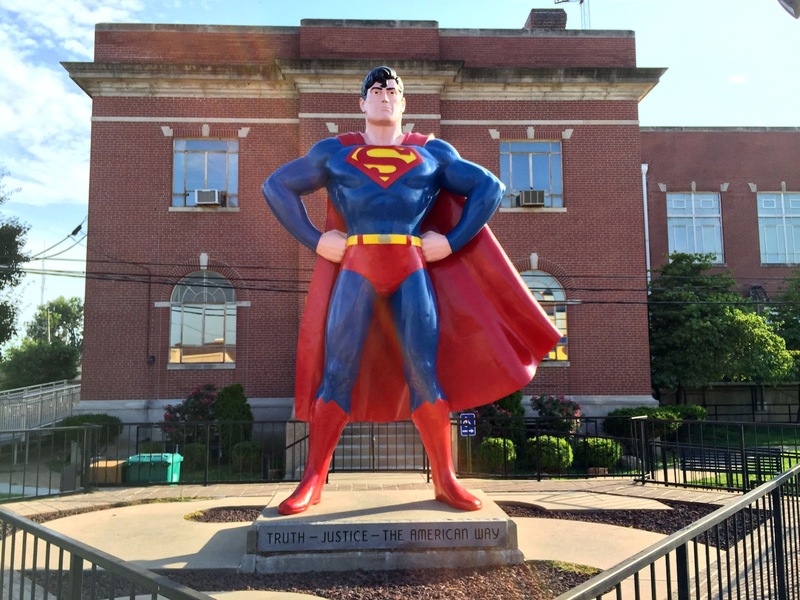 From Paducah, we crossed the Ohio River into Illinois and paused in Metropolis (pop. 6,465) to pay our respects to the guy the city has claimed as its native son. 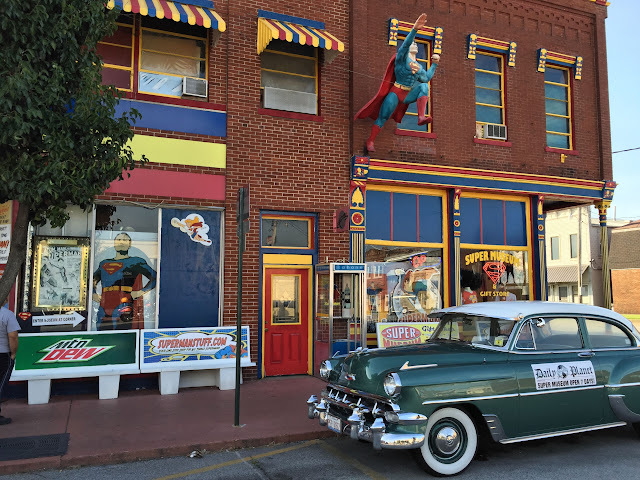 Even DC Comics, where Superman was really "born," has acknowledged Metropolis, IL, as the "Hometown of Superman." 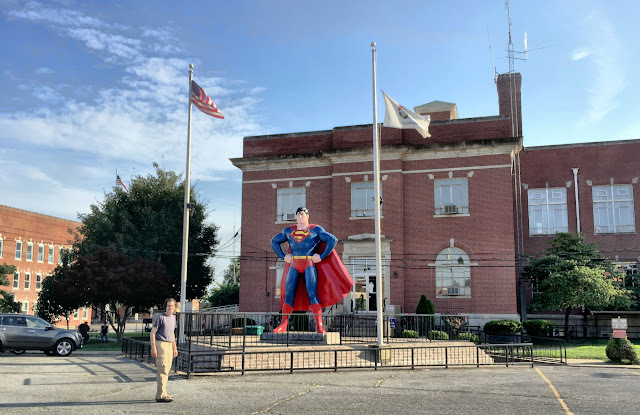 In addition to the 15-foot statue of the Man of Steel in front of the courthouse—a very popular photo op in our observation—the city hosts the nearby Super Museum, a private collection of more than 100,000 items of Superman-related memorabilia, which the owner began collecting in 1959. Like the cheese, Lois stands alone. Superman's girlfriend Lois Lane, slightly larger than life-size, stands in bronze several blocks away, attracting no attention from the many fans who were flocking to the feet of the Metropolis Marvel. Shadows were long by the time we left the Supe's old stomping ground a bit after 6 p.m., continuing west another 40 miles on I-24. 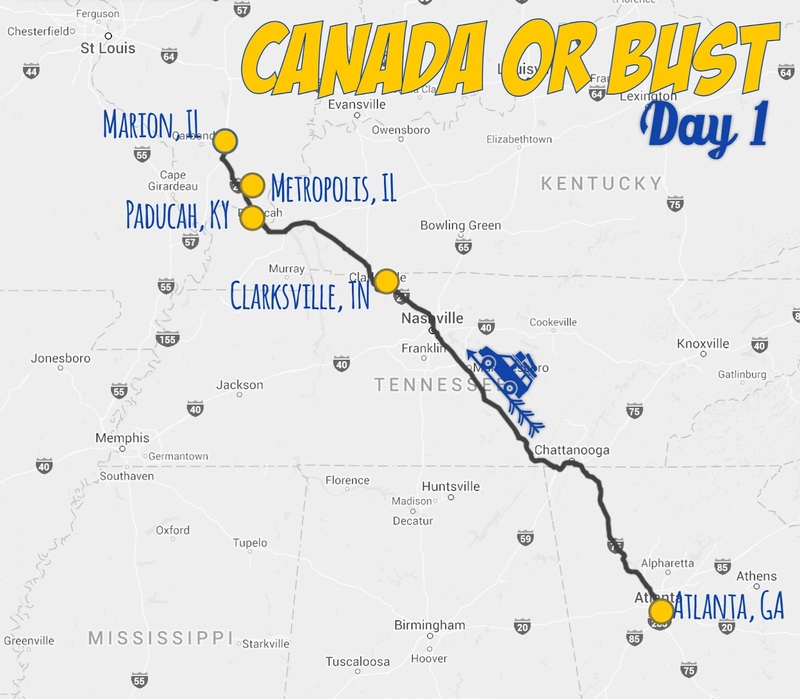 We had traversed the entire length of this 316-mile freeway—from Chattanooga to I-57, ten miles south of Marion, IL (pop. 17,193), which conveniently was our destination for the evening. 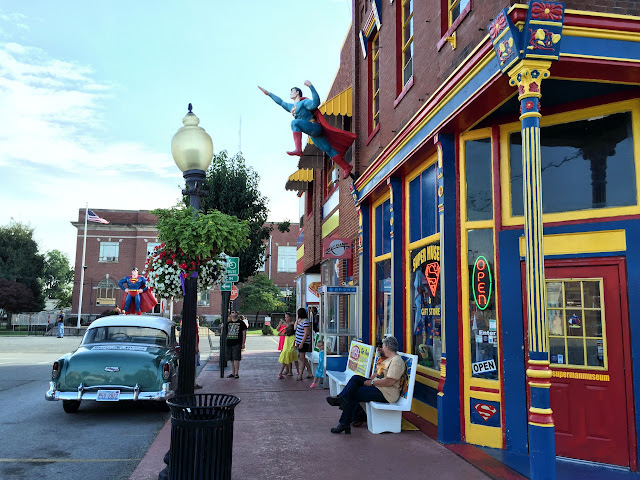 Dating from an 1839 founding, Marion has evolved from a coal mining economy to a retail center. In 1982, it was slammed by an F-4 tornado—one of the largest in Illinois history—killing ten people. Like other tornado-ravaged towns in the Midwest, the city has risen like a phoenix from this disaster. Across the street from our hotel, we saw the sleek modern stadium of the Southern Illinois Miners, the local miner minor league baseball team. Tomorrow we'll continue our journey northward toward Canada and—we hope—cooler weather.